Building on a strong bilateral relationship with Ghana, the United States is committed to partnering with the country as a beacon of stability and democracy in West Africa. As part of that partnership, the United States is working to increase trade and investment, cornerstones of the Strategy toward Sub-Saharan Africa that President Obama announced in June 2012. On her trade mission to West Africa this week, U.S. Secretary of Commerce Penny Pritzker is talking with Ghanaian leaders about the many opportunities available for U.S. businesses to partner with Ghana to help meet their energy development objectives. This morning, Secretary Pritzker met with Minister of Trade and Industry Haruna Iddrisu. She discussed policies that would facilitate U.S. companies’ participation in developing Ghana’s energy sector and helping the country meet its goal of generating 5,000 megawatts of power by 2016. Secretary Pritzker pointed out that the United States’ Power Africa initiative to double access to electricity in Sub-Saharan Africa aligns with Ghana’s broad goals to increase power generation capacity in the near term. Secretary Pritzker also met with Minister of Finance Seth Terkper and discussed some of the challenges facing the business community in the current fiscal climate. Noting that the strong trade relationship between Ghana and the United States continues to grow, Secretary Pritzker highlighted some of the Commerce Department’s initiatives focused on expanding U.S.-Ghana trade. This week’s trade mission is an opportunity to build upon our two country’s strong trade relationship by facilitating introductions of U.S. companies eager to learn about the energy needs of Ghana. Finally, in the afternoon, Secretary Pritzker met with Ghanaian President John Dramani Mahama and discussed the strategic importance of strong U.S.-Ghanaian economic and commerce relations. Secretary Pritzker highlighted that U.S. companies have a lot to offer in terms of management and technical expertise, and capital that might prove to be very useful for Ghana. 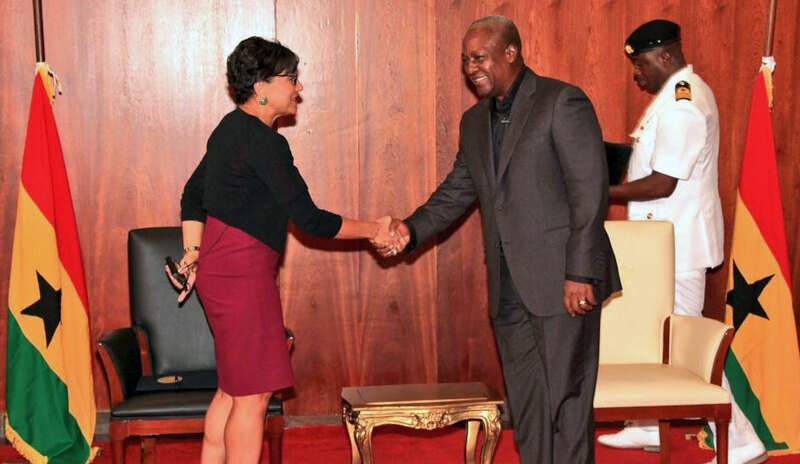 Secretary Pritzker and President Mahama briefly discussed the upcoming World Cup and the United States’ opening round match-up against Ghana. U.S. Secretary of Commerce Penny Pritzker is leading 20 American companies on an Energy Business Development trade mission to Ghana and Nigeria. The goal of the mission is to promote U.S. exports and expand U.S. companies’ presence in Africa by helping American firms launch or increase their business in the energy sector. The firms joining the mission have the expertise to help African countries develop and manage energy resources and systems, as well as build out power generation, transmission, and distribution. Africa is home to seven of the ten fastest growing economies in the world, and helping U.S. business expand their presence in these African markets is a top priority for the Department of Commerce and the Administration.